Savvy Southern Style : Would You Like Lemon With That? Would You Like Lemon With That? With the arrival of warm weather for a couple of days, and then it was gone, I got in the mood to make some new vignettes on a couple of tabletops. I wanted to just lighten and brighten to make the inside feel a little more like spring. I did not have to buy anything new. I just used things from around the house that I already had. The first thing I spruced up is the dining room table. It has a little Italian flavor added to it with some Italian pottery and a display of lemons. I did not realize that lemons were such a huge part of Italy until we went a few years ago. There were lemon trees everywhere. They plant them on the sides of mountains and in the tiniest little nooks here and there. Whatever little plot of land they have they stick lemon trees on it. One thing they produce with all these lemons is a lemon liqueur called limoncello. The Italians drink a small little glass of it after dinner to help aid in digestion. Over here in the U.S. it is usually mixed in specialty drinks. Here are a few photos of my new vignette in the dining room. The plate was bought several years ago at the Biltmore House gift shop in Asheville, N.C. The tall vase with the handles and the lidded pottery were both found at Home Goods last year. They were a steal at only thirteen and fifteen dollars. I just loved the colors of them and they are made to look old. The little basket was picked up at a flea market. The little bird was bought at a local decor shop at a going out of business sale. Used a stack of books under the vase to add height and dimension. Now I couldn't just stop with the dining room. No, no. I started changing the top of the chest in the foyer, too. Once I start changing things up I just can't stop. Usually because I am moving things from one spot to the next so then I have to fix the first thing I changed. Does that make any sense at all?! This is the before shot of the chest. Brought the tall urn from the sideboard in the dining room and the white potted plant was in my great room on the coffee table. The architectural fragment was found at a flea market a couple of years ago for ten dollars. This piece has been moved all over the house. This is a cake plate that I bought at Home Goods last fall for under fifteen dollars. I love the scalloped edge. I added the nest and a little brass bird and the same cloche that was on the chest before. It is elevated on a stack of design books. This is the full shot. 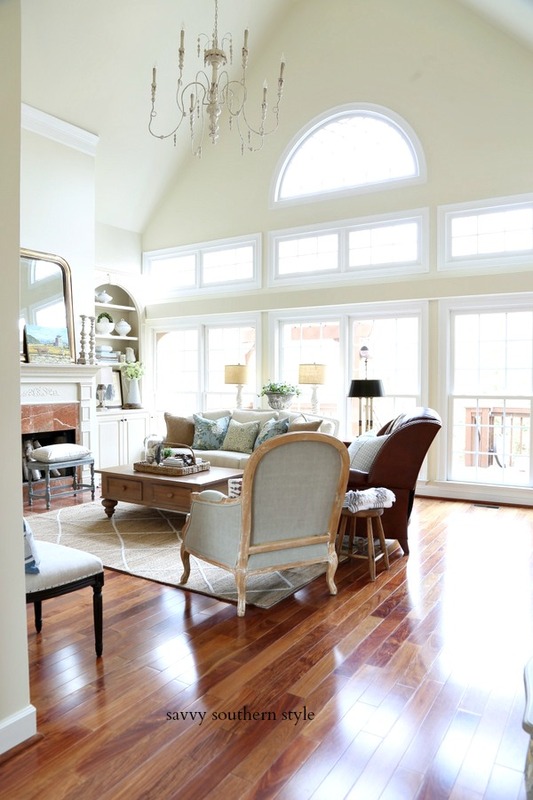 Just look around your house and move things around to create new vignettes. You don't have to buy anything and you will have a new look. Just remember it is best to display in odd numbers and vary the heights. Be sure and click on the links to these parties and check and see what everyone else has contributed this week. I am sure you will be inspired as I have. Drop me a note and let me know you came by. I appreciate all the great comments I have received and look forward to more and making more new friends. Here is a sneak peak of something I have been working on for the bedroom. I hope it turns out like I want it to. Kim, I love all of your beautiful springtime vignettes. 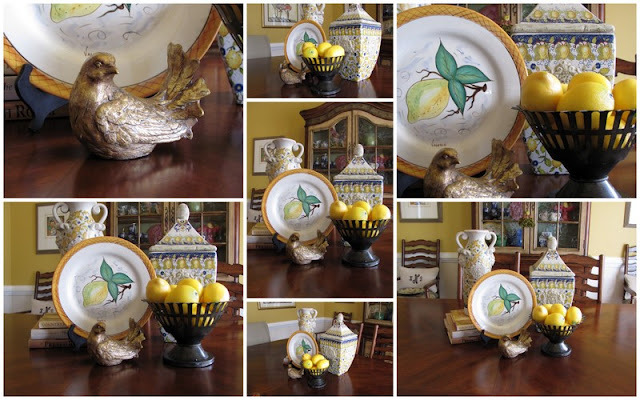 And what is it about adding lemons to a table, it just makes the whole room seem so bright and inviting! Oh I just love everything that you have done!! Are the lemons real? They look like they are! I always forget about using books for height. Thanks for the reminder! Hello Kim I am so loveing the yellow bright fresh also the pottery with the lid on the dining room table love it...I think I will go and get me some lemons..It was nice hearing about the lemon tree and Italy, my grandparents are from there and it is a place I really would love to visit, planning it for november 2011..
Kim, I love all your tabletop vignettes & the mosaic is really great! Hope you had a nice weekend. I think I know what that is you're working on....I don't want to ruin the surprise...or can we guess ??? Blue and yellow are my favorites. I wouldn't have thought that about Italy either. Lemons? Who would have thought. Wedding flowers are expensive. I kind have made it my "God thing" by doing my business on the side. Flower shops have so much overhead and I can do the same for a lot less. This wedding would have been $3000.00 anywhere else, I was able to do it for $1400.00. My degree is in floral design. I am just now using it! Wow, very pretty. 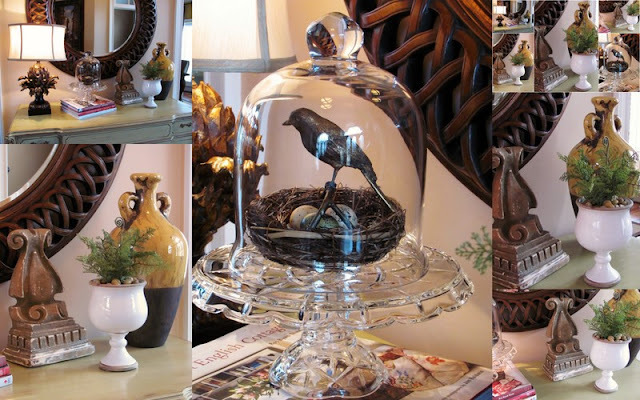 love the bird inside the glass cage.... gorgeous decors. The bowl of lemons and pottery were my favorites! Nice job! Oh my, oh my that is so pretty!! that jar is amazing as are all your items. you just have such a lovely home and everything you do has charm and flair. Love love the lemons!!! They just seem to be the perfect summery element! I love the Italian style jars. I have to keep my eyes open and start buying the things that I see and like! You have such a great eye for things. I am in purging and cleaning mode, but getting all kinds of ideas! I am looking forward to starting the decorating process. Scared, but excited! Thanks for always sharing your beautiful things! 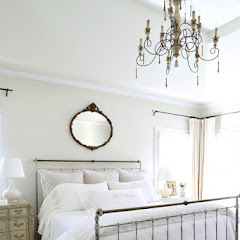 Lovely vignettes! It's always fun to mix things up! Everything is so pretty! I really like the bird under the cloche. Thanks for sharing with us. It's fun to change things up now and again! You did a nice job - love the lemons! You have to check me out! 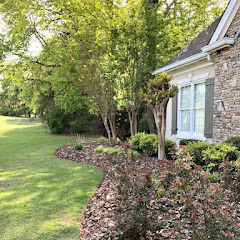 I think I actually linked up to Susan's Met Monday at Between Naps on the Porch! So proud of myself!! Love your post! The blue and yellow Italian pottery is wonderful, and your house looks beautiful. hope you'll show us some more pictures! Happy Blue Monday. I love the Italian vibe with the lemons... So fresh and happy! Well, it is decided, I have to get a cake stand and a cloche now. You have made me see something that I LOVE and now I have a goal to work towards getting them. Thanks for the great design and inspiration Kim! This post has me dreaming of sunny Italy on this rainy morning! 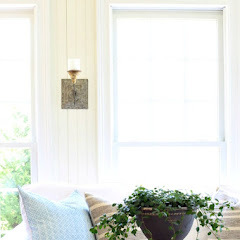 Your tall HomeGoods vase is the perfect anchor for this pretty vignette. The vase has such fine detail and I especially like the raised cartouche design. I love lemons with touches of blue too, Kim. Happy blue Monday! You have a gorgeous home and I see that you love color like me. Color was invented for a reason...right? I saw your comment today on Kim's blog so just thought I would stop by and say hello. Just beautiful! All it takes is a little sunshine and warm air and we are ready to transform things, right? Morning, Kim! Oh, how beautiful! I love your newness in the dining room - what lovely things. Don't you just love Italy? We've been there three times and I wanna go back some day. Be a sweetie and I always appreciate you popping in to see me. really impressive vignettes! I wish i have half your talent. They are really beautiful! I just love the arrangement and the cherry colors! Lovely vignettes, Kim. And yes, I would like lemon with that (lol). They smell so good! That Italian pottery is so beautiful and gives out such a wonderful feeling of cheer and warmth. Love the mosaics! The yellow and blue are gorgeous together! Happy Blue Monday! Gorgeous, gorgeous, gorgeous. You inspire me! 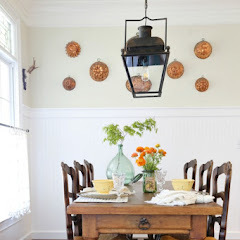 I'm doing a little makeover in our dining room too...not much, just a little vignette change or two. Just beginning the process. Hi, I love all your vignettes! Too bad you don't live near me and I'd hire you to come over and teach me a thing or too. I sure enjoy visiting your blog and get great ideas everytime! Thank you for responding to me about your paint. I must have been thinking about your dining room. That's the color I was wondering about, the lovely gold/yellow. Do you know what it is? I also love the chest in your entryway. I have a buffet I posted about that I want to repaint and distress. Did you do it yourself and if so, how did you do it? It's beautiful. "jhlaperle@gmail.com". Thanks! Gorgeous makevovers, The colors are so pretty. And it reminds me os spring. Love the little bird too. Nice makeovers! I love the challenge decorating on a budget. Your lemon vignette is so pretty! I really love your pottery pieces. Thanks for sharing! 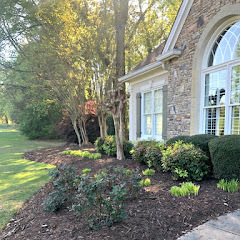 How pretty -- after the Winter we've had -- It's fun to spruce up for Spring! Your "sprucing" looks lovely. Pretty pottery! Oh, I love the blue and yellow color combination. Those pieces sure look a lot more expensive. Beautiful vignettes. Your lemon display has my mouth watering for some fresh squeezed lemonade. Everything looks so fresh and appealing. Love the cloche with the little birdie. Thanks for sharing! Some very lovely Spring Vignettes! :) I always love blue and yellow. It looks very French country to me! I adore all of that bright yellow. Just gorgeous! I love all your pretty lemon decor! I have a few lemon pieces in my kitchen. I should try moving it to the dining room. The yellow is so cheerful! And spring gets us movin', huh? Love the lemons and how your pottery just made me wish for sunshine. I love to shop my home and change things around. Love your new vignettes for spring. Yellow is such a cheery color! Hi Kim, You have quite a knack for creating vignettes! I would have guessed the lidded vase, in particular, in the first group of photos to be old. The lemons set it all off so well. And my favorite thing in the second set of pictures is the bird and nest on the cake plate under the cloche! LOVVVVVVE it!!! you have a flair for putting vignettes together very well! Love the lemons! Especially love the bird and nest under the cloche! Spring!!! I love moving things around~but you are right once you start you can't stop! Nice Spring displays! I like it! I love the bowl/pedestal that the lemons are in. Wowzer! That is all outstanding! Kim, you have such a flair for accessorizing the beautiful spaces in your home. I love hearing how you've acquired the items, too. We enjoyed limoncello on the Isle of Capri...makes me pucker just to remember! Very pretty! I wish I had a decorative eye like some many of you creative bloggers out there!